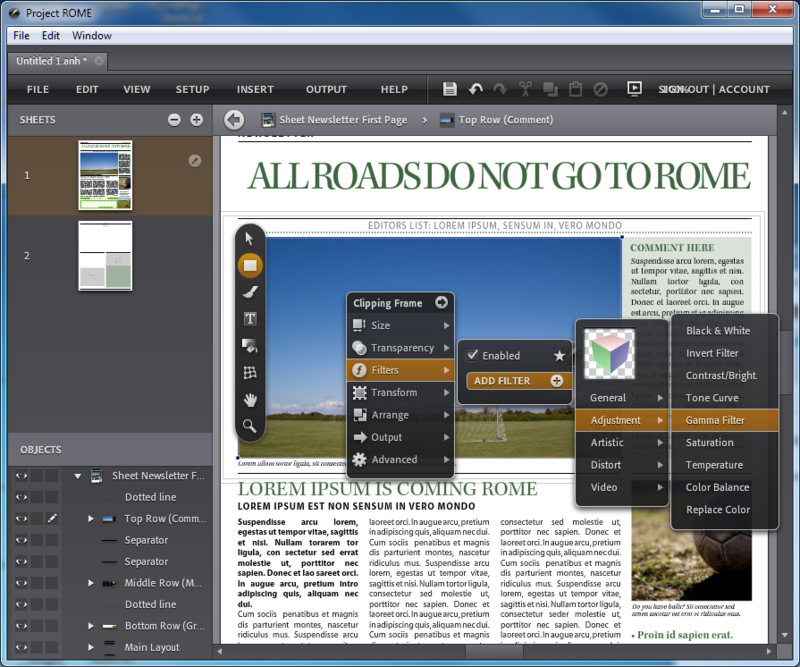 Adobe is ceasing investment in Project ROME, a labs project which provides a rich design and desktop publishing application implemented as an Adobe AIR application, running either in the browser or on the desktop using the Flash player as a runtime. Project ROME by Adobe was intended to explore the opportunity and usability of creative tools as software-as-a-service in the education market and beyond. We have received valuable input from the community after a public preview of the software. Following serious evaluation and consideration of customer input and in weighing this product initiative against other projects currently in development, we have made the difficult decision to stop development on Project ROME. Given our priorities, we’re focusing resources on delivering tablet applications, which we believe will have significant impact on creative workflows. There must be some broken hearts at Adobe because ROME is a beautiful and capable application that serves, if nothing else, as a demonstration of how capable a Rich Internet Application can be. 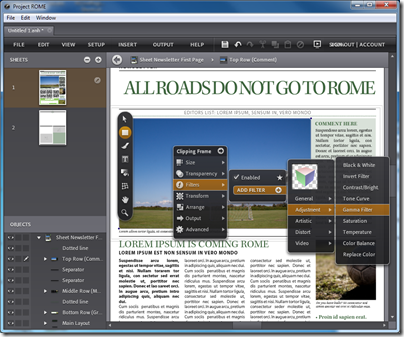 In fact, I have used it for that purpose: when asked whether a web application could ever deliver the a user interface that comes close to the best desktop applications, I showed Project Rome with great effect. I first saw Project ROME as a “sneak peek” at the Adobe MAX conference in 2009. It had made it past those initial prototypes and was being worked up as a full release, with a free version for education and a commercial version for the rest of us. Curiously, Adobe says the commercial version will remain available as an unsupported freebie, but the educational offering is being pulled: “we do not want to see pre-release software used in the classroom “. One thing that was not convincing in the briefing I received about Project ROME was the business model. It was going to be subscription-based, but how many in this non-professional target market would subscribe to online desktop publishing, when there are well-established alternatives like Microsoft Publisher? Adobe makes most of its money from selling desktop software, in the Creative Suite package. ROME was always going to be a toy relative to the desktop offerings. The output from ROME is primarily PDF. If Rome had been able to build web pages rather than PDF documents, perhaps that would have made better sense for a cloud application. Adobe did not market the pre-release effectively. I do not recall hearing about it at MAX in October, which surprised me – it may have been covered somewhere, but was not covered in the keynotes despite being a great example of a RIA. The ROME forum shows only modest activity, suggesting that Project ROME had failed to attract the attention Adobe may have hoped for. It is still worth taking a look at Project ROME; and I guess that some of the ideas may resurface in apps for iPad, Android and other tablets. It will be interesting to see to what extent Adobe itself uses Flash and AIR for the commercial design apps it delivers. Final reflection: this decision is a tangible example of the ascendancy of mobile apps versus web applications – though note that Adobe still has a bunch of web applications at Acrobat.com, including the online word processor once called Buzzword and a spreadsheet application called Tables. From what I’ve seen of Rome’s UI it does a bunch of things that are hard to do using existing Flex or Flash frameworks or libraries. I think it would enrich the Flash platform if Adobe released the code for Rome or at least released the most reusable parts that could provide scaffolding for other developers.